Alas, only a virtual trip but it was fun all the same. 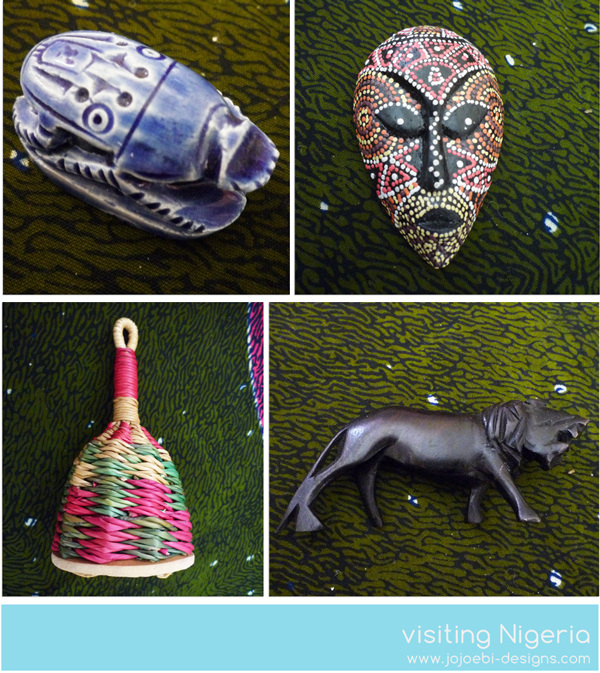 From the swaps we have done in the past we have collected a number of items from Africa, not all of them are from Nigeria but we got them out of the continent box anyway. 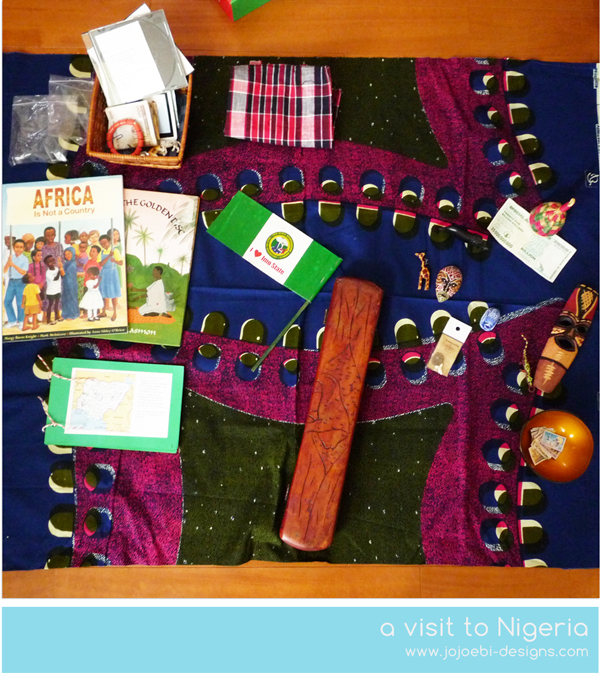 The reason we did Nigeria is that we have the most items from there, a while ago I did a swap and got a great package which included a handmade book about a child living in Nigeria and the story of her going to a family wedding, a really nice touch. The snack which was included in the pack made my Japanese speaking friends laugh because it was called chin-chin, which in Japanese is a word for 'boys bits'. Ebi-kun obviously though this was hysterical. It did lead onto a discussion of how words can have different meanings in different languages. 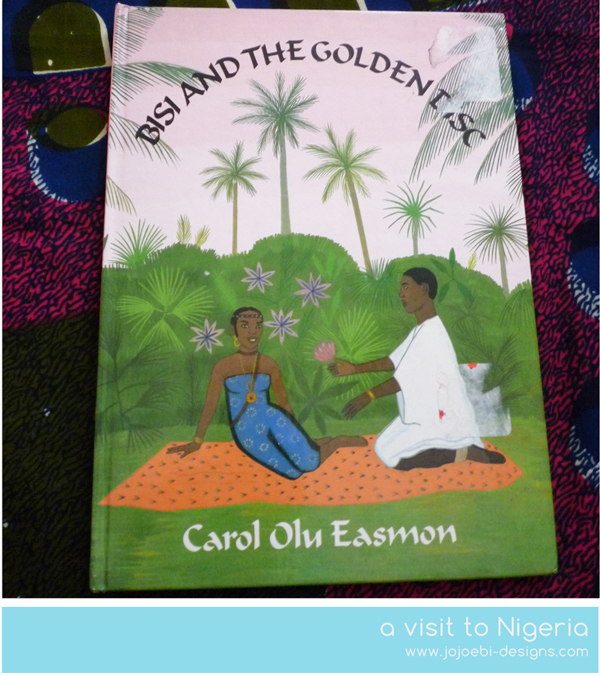 The swap pack also included this book, Bisi and the Golden Disc which was an interesting read and we also looked through Africa Is Not A Country to find the page about Nigeria. It is a great book and I highly recommend it for your Africa box. We also got out my Mancala game. This set was given to me by a good friend who did a couple of years voluntary work in Nigeria, it is hand carved and used dried beans for the stones. We do have a commercial set too that is small and fits in the game drawer. 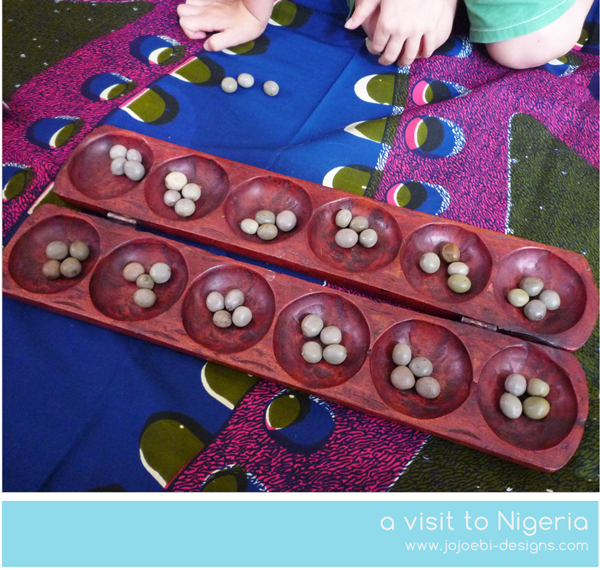 It would be easy to make a set using an egg carton and marbles, the rules to play are here. The other thing he did was the map of Africa, I bought these maps years ago so I'm not sure how correct they are now, I am sure a country or two has disappeared and a new one emerged! Whilst he was doing it he was asking me for a random fact about each country, hurrah for google is all I can say about that. Jo, Are you familiar witht eh PBS sho Arthur? There is a great episode I showed in camp this summer called "In My Africa." Ebi might like it. It is a good story, and mentions interesting things about each country. I know of it but I have never watched it, thanks for the heads up! So cool! I love your dried beans idea for the mancala game! 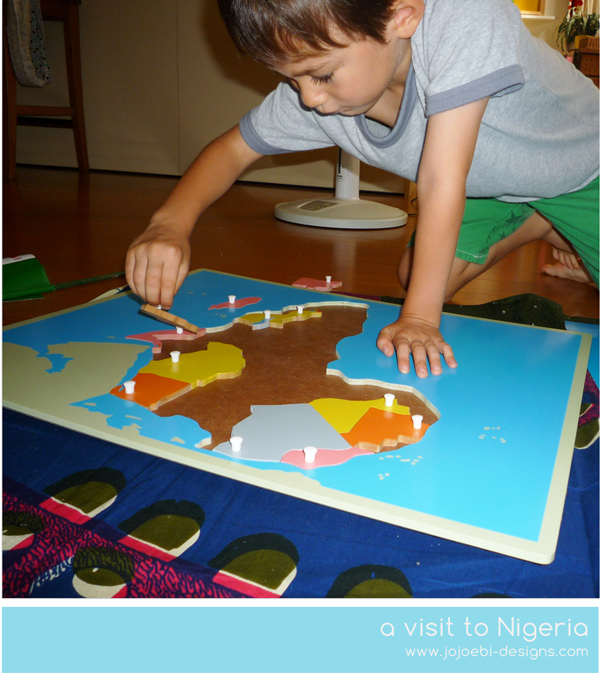 Stumbled upon your blog looking up Montessori DIY materials. Stopping in to say hi! I am now a follower!